The Excellent Eagles enjoyed the return of one their favourite lessons, I have no idea why they love it so much?! 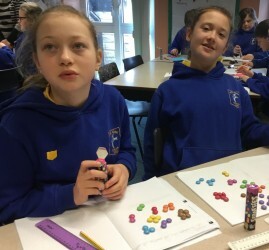 The children investigated ratio and proportion using a pack of Smarties, the aim being 'Solve the problems and you get to eat the Smarties!' This task really helps them to soldify their understanding of ratio and proportion before moving onto some real life ratio and proportion problem solving activities, later this week.